Alexey Navalny, a Russian public activist, once compared certain Moscow street intersections to animal traps. Mr. Navalny complained that the signage on these traps was designed to be deliberately confusing. This confusion invariably leads most drivers to commit "errors," thereby giving hungry policemen waiting nearby a chance to trap the driver and shake him down. Whether the animal trap analogy is appropriate is a separate question; the fact is that street signage in Russia is, indeed, rather confusing. I took this picture at the intersection of two major streets in downtown Moscow. When turning right from the feeder road of the Garden Ring to Tsvetnoy Bul'var, one is confronted with this extremely cluttered signage scene. It is as if it was designed to deliberately confuse drivers. 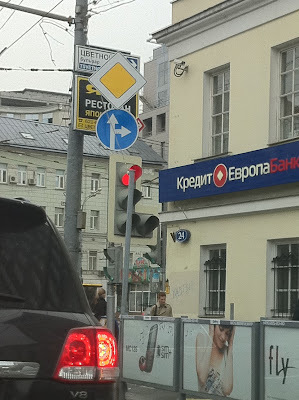 The street name sign is quite small; it must be that Russians have better eyesight than other mere mortals on the planet. Signs overlap each other; good luck trying to get a clear picture with a simple glance. And if it is not bad enough, some random pole blocks the traffic signal. You have to pay very specific attention to the shape of the traffic light (I versus L) to know whether right-hand turns are allowed with a general green sign (I) or whether they require a special green light (L). There is no other way to know other than looking at the shape of the traffic light. And the special green light on the L-shaped signal is not complemented by special red light informing the driver not to turn left. In other words, you either get a green light or nothing. There is a slight degree of additional confusion with the blue direction sign; that sign says that “one can go straight or right;” however, the traffic light says “unless I explicitly allow it – and you have to pay close attention to my shape." And what is it with the advertisement posted right next to official, information signs? This should be a crime – or at least a misdemeanor. It can be found in every country on this planet. Regarding Anonymous' posing: "It can be found in every country on this planet." This is correct. And, for the betterment of infrastructure, safer roads, and improved productivity, everyone should demand clear, easy to understand road signage. "But I think these signs look better than ...:" Cute, but a rather idiotic statement. it was an idea for you to think that even if Russia can't get rid of this problem which exists in every country (because of a fact that human can make a mistake), Russia still builds less confusing road sings than largest world economy which doesn't have such level of corruption as Russia has. Bannerizer made it easy for you to promote ClickBank products with banners, simply go to Bannerizer, and grab the banner codes for your selected ClickBank products or use the Universal ClickBank Banner Rotator to promote all of the ClickBank products.